Fly fish Beavers Bend with world-class expert guides! 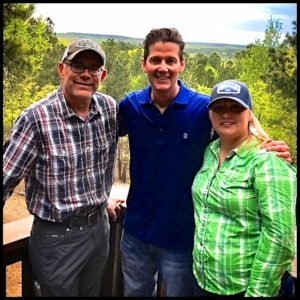 I was honored to have Rob and Jenny Woodruff stop by Mountain Vista to tour the cabin and checkout the views. We had a great discussion about fly fishing in Beavers Bend. They’re the only trout anglers in the region endorsed by Orvis. Rob and Jenny are in high demand in multiple states and globally. Their kindness and fly fishing expertise blew me away! They’re committed to showing you an outstanding adventure on Mountain Fork River. These world-renowned pros strive to preserve the river’s habitat. Rob and Jenny enjoy educating clients about multiple techniques and entomology. 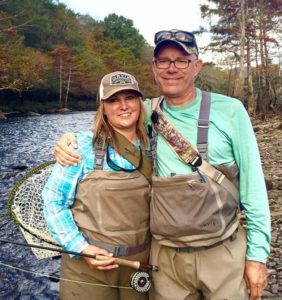 Fly Fish Beavers Bend-Learn From Pros! Proper conservation and fly fishing ethics are the reason they’re considered the top trout guides in the region. Rob and Jenny only accept two clients each per-outing. This enables them to provide top-notch individualized attention. They provide Orvis state-of-the-art technology, including all the tackle and supplies you’ll need. Lunch is even provided on full-day trips. Rob and Jenny’s clients range from novice to professionals. They’ll help you improve casting techniques and teach you the fine art of presentation. 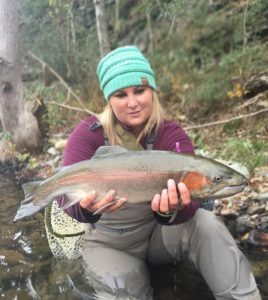 Follow Jenny on Instagram to see scores of beautiful fish and happy clients. Rob’s a perfect gentleman, but he doesn’t allow Jenny to get the upper hand when landing trophy size trout. Checkout his Instagram page! We’ll have Mountain Fork River fly fishing and luxury cabin stay packages at Mountain Vista announced soon! Remember to book your 2017 Broken Bow fishing trip early with them. They’re highly popular and spend over 200 days per-year wading the beautiful streams of Mountain Fork River. All trips are catch and release. Fly fish Beavers Bend in style with Beavers Bend’s only prestigious Orvis endorsed professionals. Contact Rob and Jenny to enjoy a fantastic day on Mountain Fork River.